There are a lot of different Amsterdam canal cruises available in the city, and each one offers something slightly different. The supply of Amsterdam canal boats is even a bit dazzling to the unsuspecting visitor. From large boats packed with daytime sightseers and photograph hunters to intimate, candlelit dining on the 165 canals in the "Venice of the North", you can be sure to find the cruise to suit you, if you're prepared to investigate a bit. This page shows your main options. The Lovers cruise company is one of Amsterdam's most prominent and can be found at Prins Hendrikkade 25 - 26, just outside of Central Station. As the name suggests, Lovers is great for couples and the 2 hour Redlight Candlelight Cruise, complete with wine and cheese, is a great way to see the canals with your partner. It's not just for couples though, the Lovers Day Canal Cruise or Hermitage Cruise are great for sightseeing while the Dinner Cruise during the summer offers a four course menu and makes for an enjoyable group trip. Call 020-5305412 for more information or visit www.lovers.nl. Canal Company, with a main office at Weteringschans 26, is known best for the Hop-On-Hop-Off Canal Bus for which you can buy tickets for 24, 48 and 72 hour time slots. The Canal Bus, depending on the day, follows up to 4 routes where you can get in and out at 20 stops between 10am and 7pm. As most places in the Amsterdam city center can be reached through the canals, it's a nice alternative to the hop-on-hop-off buses. The company also runs the Canal Hopper, which is also a hop-on-hof-off canal bus but with a much smaller 12-person boat. Contrary to the standard long canal cruise boats, this one can also get into the canal roads less traveled. The skippers tells you personally about things to see, while the larger boats typically play tapes about the sights. You can also rent their canal bikes (pedal boats for 2 to 4 persons) at their docks near the Leidseplein, the Anne Frank House and the corner of Keizersgracht & Leidsegracht. Call at 0900-3334442 or visit www.canal.nl. 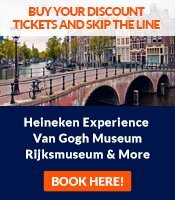 Amsterdam Canal Cruises is found a little out of the city centre close to the popular area of de Pijp and the Heineken Experience at Nicolaas Witsenkade 1a. This family and group oriented cruise company offers drinks, lunch and dinner cruises as well as the more standard sightseeing tours. Dinners cruises are offered via the Blue Boat Company and can take many different forms with varied menus while the drinks cruises have either an American party or Dutch theme. Timetables change between the busy summer months and quieter winter months, so call 020-6791370 or check their website at www.amsterdamcanalcruises.nl before you show up. The sister company of Amsterdam Canal Cruises, Blue Boat Company has a truly staggering variation of cruises to choose from. Sightseeing trips include the standard City Cruise and Evening Cruise as well as the open Blue Sky Boat for sunnier days. If you're looking for something as little bit different, the Sing Along Boat offers passengers the chance to be part of a live skit. For the gastronomically inclined, Blue Boat Company has the best selection of lunch and dinner cruises in Amsterdam; the Breakfast Cruise, Coffee Cruise, Gentleman's Lunch, BBQ Summertime, Italian Buffet and traditional Dutch Experience to name but a few. Pay them a visit close to the Heineken Experience at Stadhouderskade 30, call them on 020-6791370 or visit www.blueboat.nl for more details. Started in the 1920s by a true Dutch entrepreneur, this canal tour company is now proud to call itself one of the largest in Amsterdam. The hour long tour departs every 30 minutes from the jetties at Central Station, Rokin, Damrak, Leidseplein and Amstel and makes a circuit of the old centre of Amsterdam. During the summer a candlelit evening cruise is also available. The Amsterdam by Candlelight must be booked in advance and departs the jetty at Rokin 125 at 9pm. For information/bookings call 020- 6233810 or visit www.rederijkooij.nl. 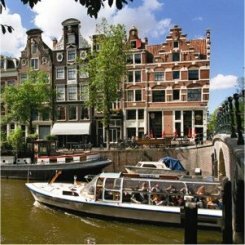 If you are interested in something a little different from the regular large, tourist filled Amsterdam canal cruises, Jewel Cruises may well be what you're looking for. A much smaller company than most of the Amsterdam cruise operators, Jewel Cruises operates from the city's only classic riverboat, built in 1898. The cruise is focused around gourmet food and lasts just under three hours, in which time you will be wined, dined and have seen much of Amsterdam's canals. 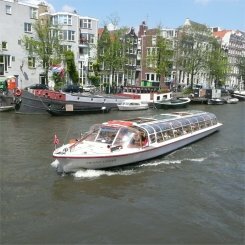 Their base is in the city centre at Singel 235 and the boat is also available during the day for private or business cruises; call for booking at 020-4221385 or visit www.amsterdamjewelcruises.com. The city is full of companies offering Amsterdam canal cruises, so feel free to check out Holland International Canal Cruises at Prins Hendrikkade 33a (tel. 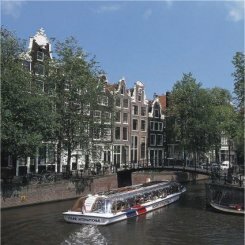 020 625 3035, web www.hir.nl) for their 100 Highlights Cruise, Ultimate Cruise, Candlelight or Dinner Cruise as well as Canal Cruise Amsterdam by the Anne Frank House at Leliegracht 51 (tel. 020 337 9733 web www.canalcruisesamsterdam.com) for their 1 hour cruise. If a cruise boat isn't your thing, then check out Canal Bus at Weteringschans 24 (tel. 020 623 9886 web www.canal.nl) to rent one of the canal bike peddle boats they offer in addition to their Hop On Hop Off lines.